ABOVE: A peak through the clouds. 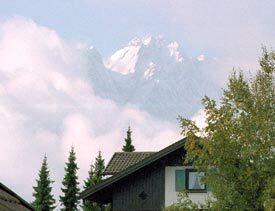 Germany's highest mountain, the Zugspitze, is also one of its most accessible. A cogwheel railroad and three different cable cars provide an effortless route to the top, where you can enjoy views of four countries before sitting down to a pleasant meal or quaffing a drink on a terrace overlooking a glacier. You might even find yourself witnessing a press event for the latest model BMW, observing a TV commercial shoot, or waving at a bride and groom as they emerge from Germany's highest-altitude chapel. Need to check your e-mail without mobile-phone roaming fees? Log onto the Internet at one of the Zugspitze's public terminals. Having a family reunion? Book a conference room with a projector for Uncle Phil's digital slide show. Okay, the Zugspitze isn't Mount Everest, and Hillary wouldn't have needed Tenzing's help to reach the top. But don't let the restaurants, scientific observatories, or communications antennas fool you into thinking that you're in the Munich suburbs--even if the German Alpine Club hut does have a sign that reads "Münchner Haus." The Zugspitze is very much a mountain, and its scenery is nothing short of spectacular. No visit to Garmisch-Partenkirchen is complete without an ascent to the highest point in Germany. As attractions go, the Zugspitze ranks a solid zehn on a scale of ten.